Vertical gardens feature plants grow in containers, suspended in the air. This is sometimes done for decorative effect, and sometimes just an efficient use of a small garden space and a way to increase crop yield. To make plants in vertical gardens easier to water, their hanging planters are sometimes attached to pulleys to lower and raise them to make maintenance easier. 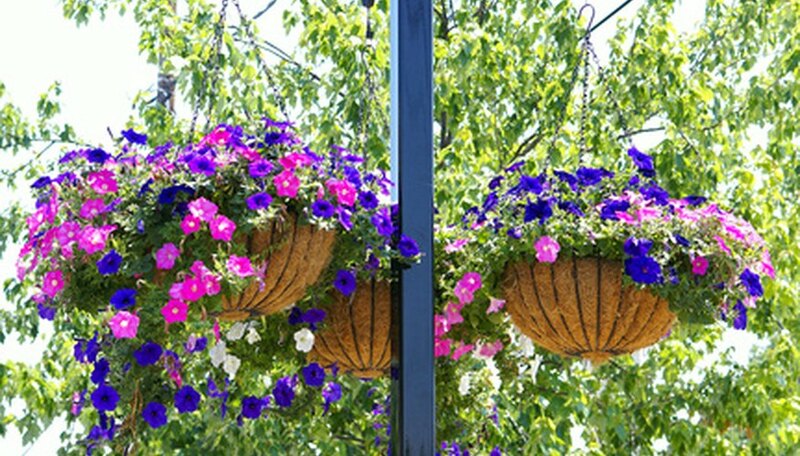 There are two types of pulley systems that you could use for your hanging planters. One is a simple pulley. You pull down on the rope and your planter is lifted into the air. The other is a compound pulley system, using multiple pulleys. These are a little more complicated to install, but they allow you to lift heavy planters while only exerting a small amount of force. A compound pulley system has a minimum of two pulleys. One is hung overhead, with a rope threaded through it. The other has one end of that rope threaded through it and then tied to the bottom of the frame of the pulley hanging overhead. The overhead pulley is the “stationary pulley” and the other is the “moving pulley.” The moving pulley is hooked to the wires of your planter. Compound pulley systems work by means of mechanical advantage. When you pull on the free end of the rope, you lift the moving pulley up towards the stationary pulley, as well as the planter that is hung from it. Because of the ways that they pulleys are arranged, the rope on the left side of the moving pulley is lifting it up. So is the rope on the right side. This doubles the force that the pulley is exerting on the hanging planter. This allows you to lift the planter like it only weighs half of what it usually does. However, as a trade-off, you have to pull 2 feet on the rope for every foot the planter lifts. You will need to have a hook placed somewhere low down near your hanging planter. This is to tie the rope to after you have lifted the planter into position. The hook will need to have its end point downwards instead of upwards, to keep the rope from sliding off. You may want to leave a few feet of rope after the knot where you tie the rope to the hook. This will help you reach the rope easily to lift your planter after it has been lowered. To hand the stationary pulley, screw a screw-ended hook high into the side of some handy support. You can use a trellis, wall or tree if you are gardening outside. Use an overhead beam for support when vertical gardening on a balcony. Jason Thompson has been self-employed as a freelance writer since 2007. He has written advertisements, book and video game reviews, technical articles and thesis papers. He started working with Mechanical Turk and then started contracting with individuals and companies directly via the Web. Can I Install Vinyl Railing on a Cement Porch?